My kids love drawing and colouring – it can keep them entertained for hours – but beware the moment when they can’t find just the right shade of whatever colour it is they’re looking for. Spare your little artists their next colour catastrophe with Crayola Marker Maker. This latest invention from the creative minds of Crayola allows your children to make their very own markers in – wait for it – whichever colour they like. So no more bemoaning that they can’t find the right hue of blue for their sky or the perfect purple for their butterfly wings. Now they can just go ahead and make it themselves. 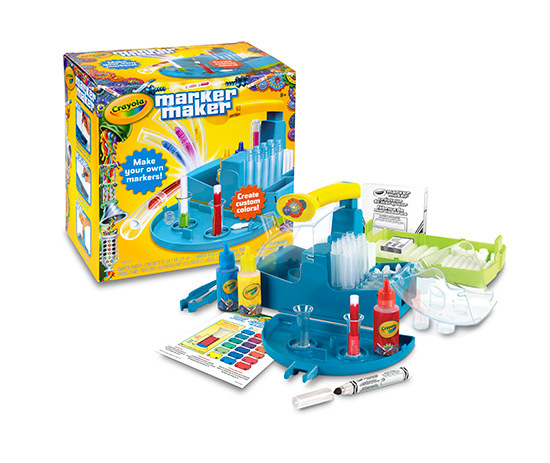 The Crayola Marker maker looks pretty easy to use, and includes enough ink and bits and pieces to make sixteen custom makers. Kids can create their own colours from scratch or follow the colour mixing guides that are included in the kit, which also comes with red, blue and yellow ink bottles, two marker boxes, two measuring tubes, tweezers, and all the barrels, labels, cores, tips, caps and plugs needed for putting your markers together. My favourite part of this toy isn’t that it allows kids to create custom markers, though that’s certainly pretty cool. It’s how Crayola Marker Maker introduces them to some basic principles of science along the way and shows how science and creativity are the perfect match-up. The folk at Crayola tell us this toy is best suited to children aged eight and over, though I think it’s the perfect parent-child joint project for those with slightly younger children. I’m already planning to grab one and have a go together with my six-year-old colouring-mad daughter. I’ll let you know what crazy colour combos we conjure up. Find Crayola Marker Maker at Big W for $30 in-store or online. Refill kits are also available for $14.